The Utility HE is a floor standing system boiler. It is a condensing oil fired boiler with an output of 21kW and an efficiency rating of 90.7% - giving it an A band rating. It is also available in 26kW and 33kW options. It is designed to fit neatly into your kitchen or utility room and comes with a highly efficient heat exchanger that is easily accessible for servicing. This boiler is compactly sized, with a height of 865mm, width of 413mm and depth of 600mm, making it an easy boiler to install and hide away. It comes supplied with a pre-wired factory fitted burner, thermostat and circulating pump, and one IEC320 mains socket. It offers a multi optional flue system that can be placed at the top, back, left or right hand side of the casing. It also comes supplied with a pre assembled expansion vessel, pressure gauge and filling loop, as well as a pressure hose for connection to the system. This boiler can be installed within a few minutes due to it having a system kit that can create a sealed heating system extremely quickly and efficiently. 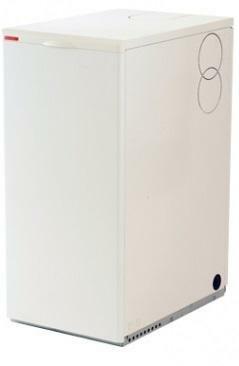 It also uses the latest riello burner technology which makes it one of the quietest boilers when in operation. This boiler comes with five year warranty.